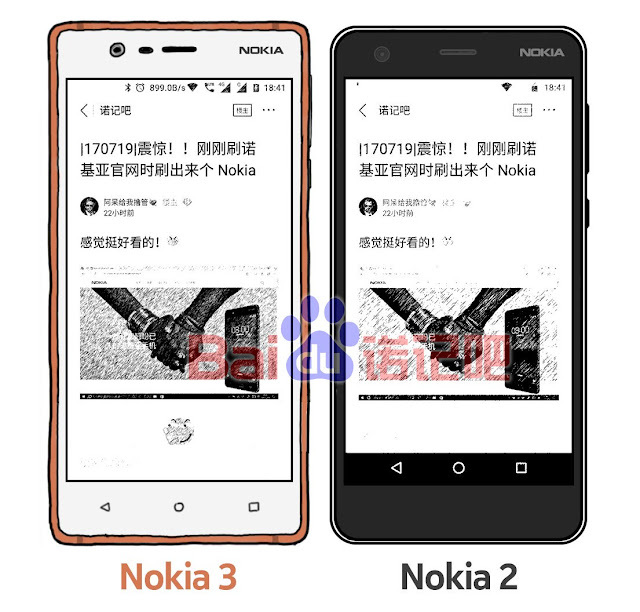 LoveNokia | Latest News and Information about Nokia Mobile: LEAK | Nokia 2 leaks in a sketch!! LEAK | Nokia 2 leaks in a sketch!! HMD Global is rumored to announce some high end Nokia phones very soon. But that's not all. It seems, HMD Global might also release an ultra budget smartphone in the form of Nokia 2 in near future. @baidunokibar on twitter shared a sketch of Nokia 2 alongside Nokia 3. Nokia 2 will be an entry level Android smartphone and will be powered by a Qualcomm Snapdragon 210/212 Processor. If we compare both the phones in the sketch, Nokia 2 appears to have a slightly larger screen than Nokia 3. Nokia 2 might come with a 5.2 inch screen. As per the sketch the phone also lacks capacitve keys in favour of on screen navigation keys. The design of Nokia 2 looks very much similar to Nokia Lumia 620.